Each and every sign rising in the ascendant creates some peculiar circumstances in the life of the native because different ascending signs have different sets of planets as functional malefic planets and functional benefic planets. The special effects, thus, are created due to placement of the signs of weakness prone planets, the Moon and Mercury, and due to different pace of movement of the planets. The subject has been discussed in the book with the help of case studies. 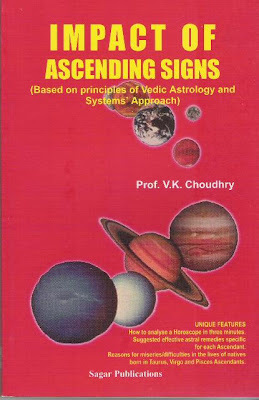 Effective sets of astral remedies developed after empirical studies for various ascending signs have been given in the book for warding off the evils and generating good results in life. When used as a preventive measure, these save the natives from dreaded diseases including cancer even if strong combinations for such diseases are present in the natal chart. In addition, the use of a Kavach (protecting shield) as per directions helps in harnessing the good planetary influences to their full potential. The major benefit of the System's Approach is that it gives precise indication of trends in life.